I am a huge lover of public television-no commercials and the programming is so great. I don’t know if it’s like this all over but I have a spin-off of one of my regular PBS channels called Create. It’s cooking, crafts, gardening and travel. It’s got great shows-Pepin, Child, America’s Test Kitchen and so on. If you ask me Food Network could learn a lot from them-such variety. I’m getting off the point here. Nick Stellino is one of the chefs that has a show on the channel and he makes some yummy stuff. The fritatta below was inspired by him. Pretty easy and really tasty. The onions cook for a while so they get nice and sweet. 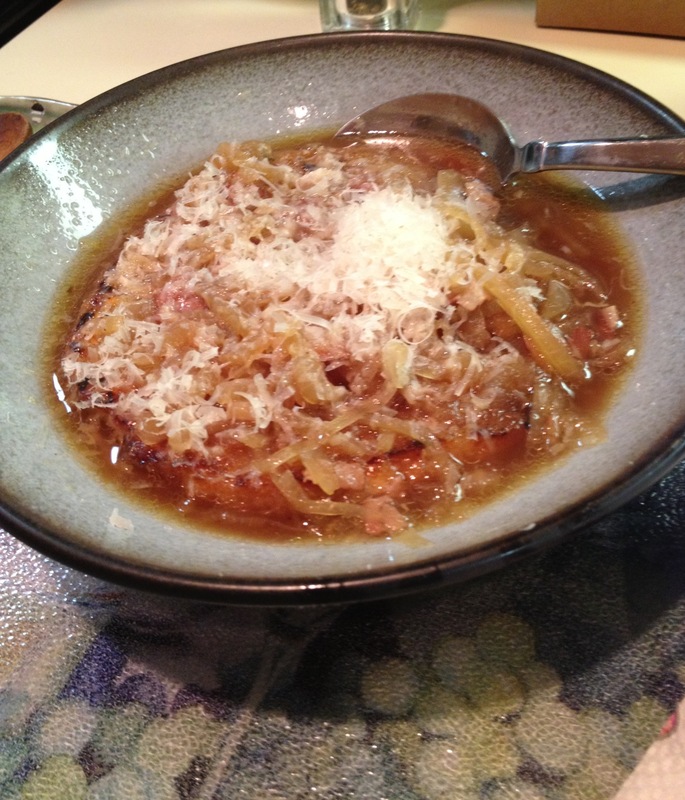 This is delicious warm or great at room temperature the next day or reheated. 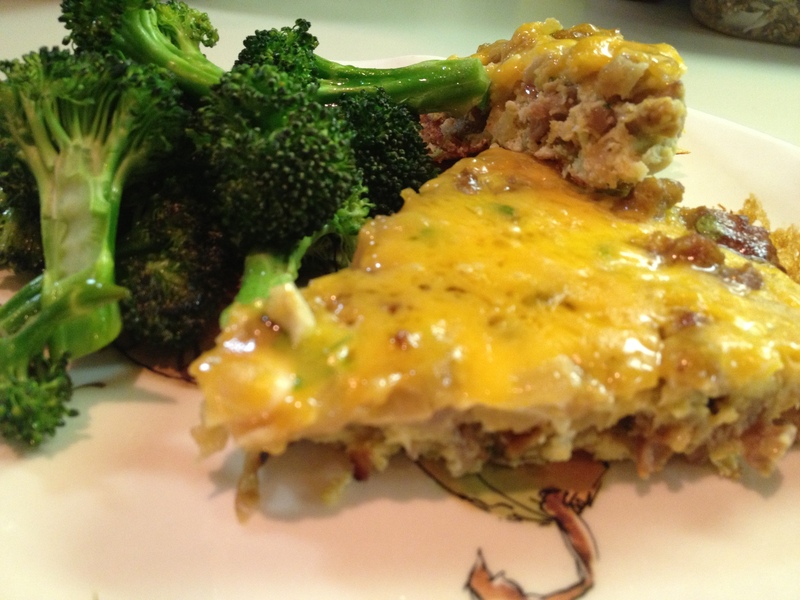 I served it with my delicious roasted broccoli. Cook 3 tbsp oil in an oven-safe 12 inch non-stick skillet over medium-high heat. When it’s hot add the onions, red pepper flakes and thyme and stir well to combine. 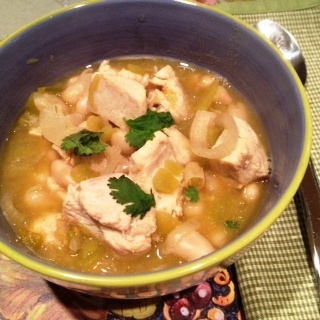 Reduce the heat to medium-low and cook for 20 minutes, stirring every few minutes to avoid sticking. While the onions are cooking brown the sausage. When it’s cooked put the sausage in a strainer to drain of excess fat. Discard the fat and keep sausage on the side for use later. In a bowl beat the eggs with 1/2 tsp salt and set aside for use later. When the 20 minutes for the onions is up add 1/2 tsp of the salt, the pepper and 1 tsp of the garlic, reduce heat to low and cook for 20 more minutes stirring every few minutes again. Then pour the mixture into a large bowl. Wipe the pan clean. Add the cooked sausage and parsley to the onions and mix well. Then add the beaten egg mixture and the remaining garlic and mix well. In the pan wiped clean cook the 3 remaining tbsp of oil over medium-high heat. When it’s hot pour the contents of the bowl into the pan. Cook for 2 minutes then stir. Cook for another 5-7 minutes until just set then transfer to the oven and bake for 15 minutes then remove, sprinkle the cheese on the top, and return to the oven for another few minutes until cheese is melted and bubbly. Remove and allow to cool for a few minutes before cutting into wedges and serving. I always worry about burning the hell out of my hand by grabbing the handle of the pan after it’s out of the oven and cooling so usually I keep the handle turned way in so that I can’t grab it. 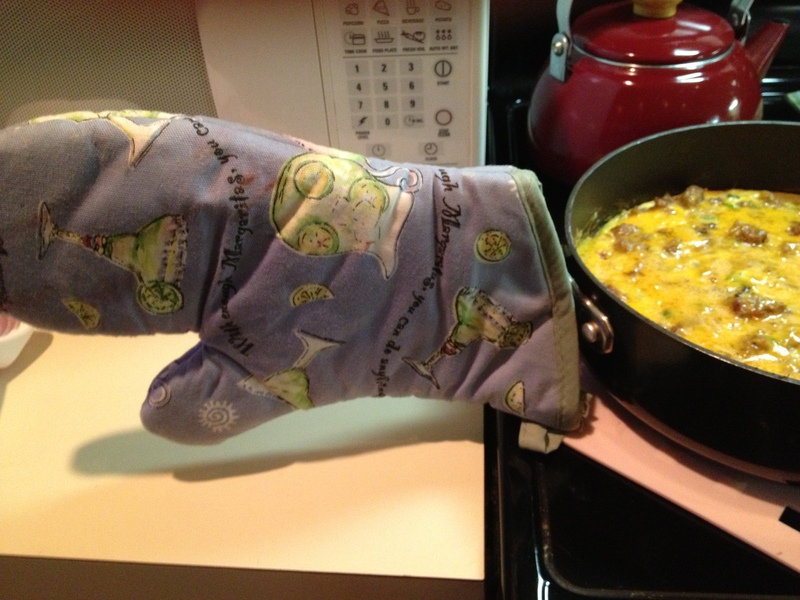 How I never thought to just put an oven mit over the handle before is beyond me. Now I don’t have to worry (and yes those are margaritas on the oven mit :). Onions. Yum! 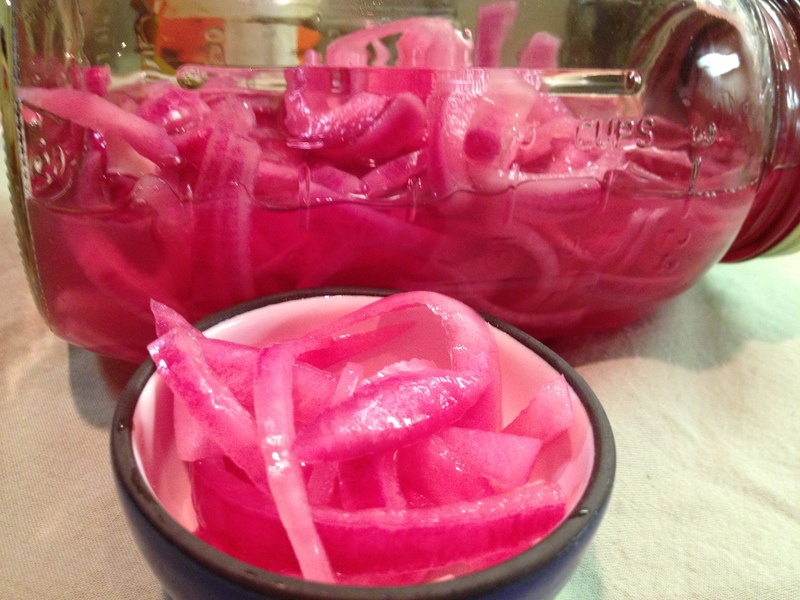 Pickled Red Onions. Double Yum! I saw these on three square chef’s blog and knew immediately what I’d make for this month’s recipe swap. 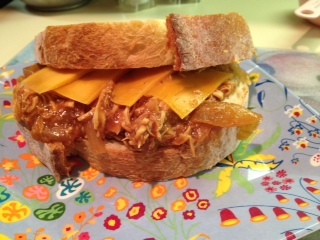 I love these onions on burgers, sandwiches-you name it-but I had never looked into making them before. It couldn’t be easier and they’re so delicious. Tart and tingily and oniony and slightly sweet. A great addition to really anything! I put these on falafel burgers that I made last night and will post that recipe next week. Whisk all ingredients except onion in a small bowl until the sugar and salt are dissolved. 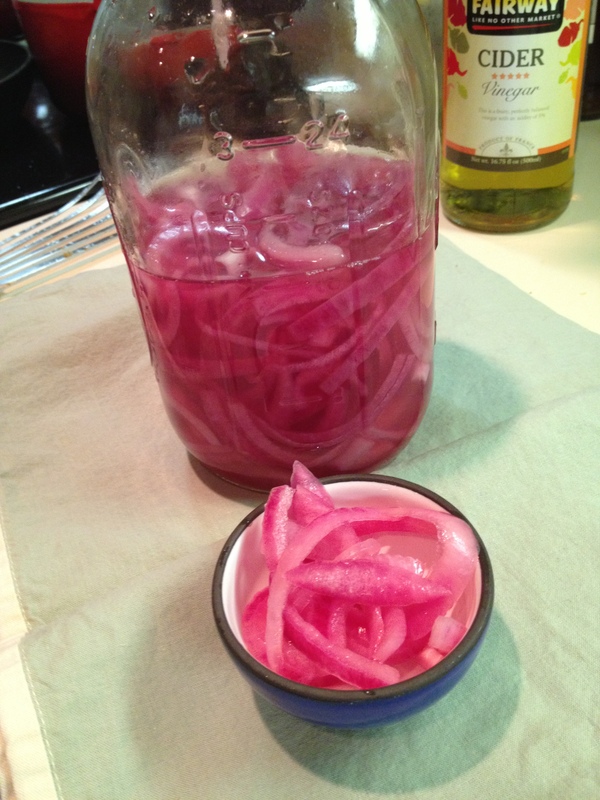 Place sliced onion in a jar and pour the vinegar mixture over it. Let it sit at room temperature for 1 hour or store it in the fridge.